L'attitudes allows you to take the work out of ethnic flavors. 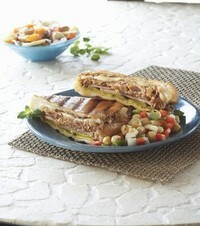 Pair our Cuban, Mojo with pickle, cheese. Thaw packages in refrigerator. Remove from plastic package and put entire contents of package in foil pan/hotel pan. Place uncovered in a pre-heated 350° F oven for approx 60 minutes, then break apart with tongs, meat forks, or dough cutter. Place back in oven and cook for another approx 60 minutes until thoroughly heated and browned and the internal temperature reaches 140° F as measured by a meat thermometer. Remove from oven and break apart/shred further (while still in the pan), with a tongs, meat forks, or dough cutter. Place liquid in a medium sauce pan and reduce over medium high heat to 1/3 the volume. Cool and add the mayonnaise, mixing well. Slice Cuban loaves in half. Spread mojo mayonnaise and mustard on both sides. Place one slice of Swiss cheese on bottom half of bread. Place turkey on top of cheese. Top with pickles and another slice of cheese. Top with remaining half of bread. Brush sandwich with melted butter and place in a Panini press until golden brown and crispy. Slice and serve warm.